This cruise project has become an important milestone in cruise tourism in Honduras, and more specifically the Bay Islands. The two-berth cruise terminal is capable of accommodating up to two post-Panamax ships simultaneously with over 8,000 passengers. The facility is located in a stunningly beautiful region locally known as Dixon Cove, on the southwest coast of the island of Roatan. 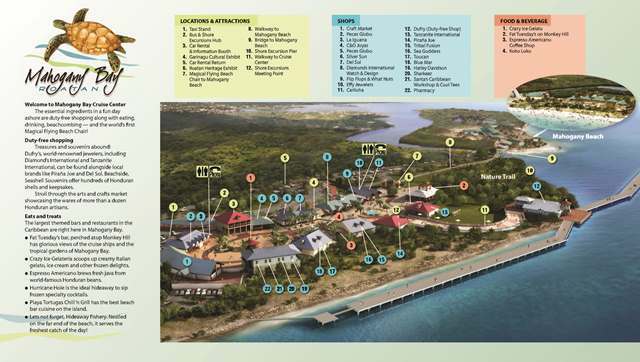 In addition to the two cruise berths, a 20 acre welcome center await tourists visiting the island. This welcome center provides an amazing shopping experience and it also allows easy access for our visitors to enjoy excursions by land and sea. Unique to Mahogany Bay is a new chair lift system that takes cruise ship guests from the welcome center to beautiful Mahogany Beach, a 10-acre private island featuring an 825-foot-long white-sand beach with a beach volleyball court and myriad watersports opportunities. The cost of riding the chair lift is $14 for adults and $8 for children 4 to 12 years old for an ALL DAY PASS. Children 0 to 3 years old ride FREE. It transports guests of all ages who are at least 32 inches tall and holds a maximum of 600lbs per chair. We also feature eight exclusive cabanas at Mahogany Beach that are also available for rent. Please contact your cruise line to book these and all other available excursions.